If you’ve been to a wedding in the past year or two, there was probably a photo booth present. The popularity of these photo booths has risen a lot during the age of Instagram and Snapchat. There are over 5.2 million posts on Instagram with the hashtag #photobooths, and it’s only growing. Getting one would be a great way of generating more memories for you to take home, but what’s the best way to use that photo booth picture afterward? Let’s explore a few ideas. The way photo booths usually work is they’ll print several copies of a reel. This way, you can give a copy to the people in the photo, and also keep one for the bride and groom (if requested). For the bride and groom, you can create a collage or collection of these images to hang up in your home. It’s a great use of these pictures because people generally take wacky photos in the photo booth. You can hang up the photo strips of your most important family and friends, immortalizing them forever in your home. It’s a relatively easy project that won’t take much effort to make! Putting your photo booth pictures in an album is a cute way of keeping all these memories accessible and ready for display. You can do this on your own after your wedding. Alternatively, you can make it a fun activity for your wedding guests too! A fun idea for your wedding is to leave a guestbook open by your photo booth so that guests can take photos and paste them into your album. Then they can decorate the page however they’d like! Make sure you get an album that has enough pages! There are definitely going to be social media addicts at your wedding. Give them something to do by creating a hashtag that all guests should use. This way, you can get them to share their photo booth pictures online. This is a fun way of sharing the best moments of your wedding with your friends and family that couldn’t attend. Make sure everybody knows where to share their photos online and that you’re counting on them! It also gives you a way of revisiting all the photos people took during your wedding. 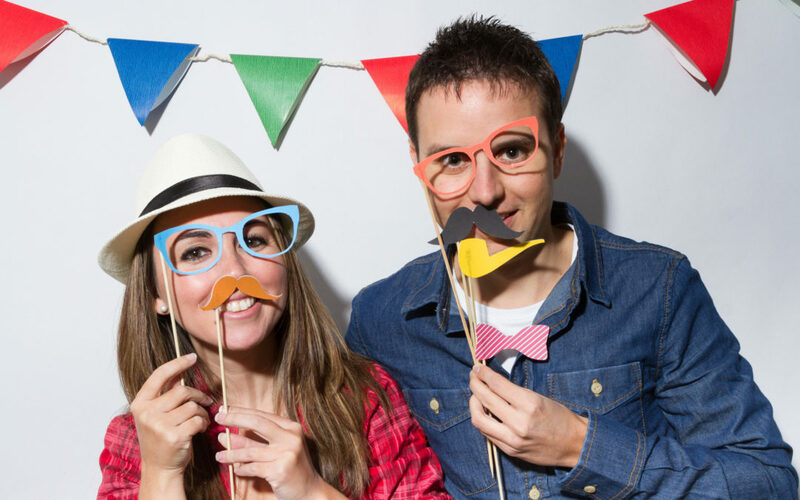 If you’ve placed your photo booth at a convenient location, it’ll be easy to build up a large library of pictures. You can keep this going by having a TV or projector displaying all the pictures people have been taking. It’s always fun to see the random wacky photos that people take in a photo booth. In addition to any extra keepsake gifts you might have, photo booth pictures are great gifts for guests to bring home. This lets them keep a reminder of your wonderful day and the fun they had during it. Make sure you customize it a little bit so that you’re not just letting them keep the image. One way to do this is by giving a key ring with a note on it to every guest during the wedding. The goal is to get everyone to take a photo booth picture and to have something to bring home later on. A lot of people take multiple pictures so you know they’ll fill up quickly! If you’re worried about photo booths being overdone, don’t be. A photo booth picture is one of the best ways to keep the atmosphere lively during a wedding. They’re fun, interactive, and easy to implement. If you’d like to have a photo booth at your next wedding or event, we’ll make sure you have the experience of a lifetime.